ABBA ABBA is one of Anthony Burgess’s most inventive works, blending historical fiction, poetry and translation into a novel which celebrates John Keats and the sonnet form. Set in Rome during the winter of 1820-21, the first part of ABBA ABBA recounts Keats’s final weeks and his eventual death from tuberculosis in a house on the Spanish Steps. Burgess’s vision of Rome is rich with cheap wine, terrible food and colourful characters as he imagines Keats’s interactions with Italian poets and translators, particularly the sonneteer Giuseppe Gioachino Belli, who wrote in the Roman dialect. As Keats fades away into posterity, Belli takes over the focus of the book, and Burgess translates seventy of his bawdy sonnets into Lancashire English. The fictional Keats narrative provides a context for Burgess’s translations of Belli’s sonnets, and the novel posits unsuspected connections between one of the greatest English poets and the traditions and culture of Italy. 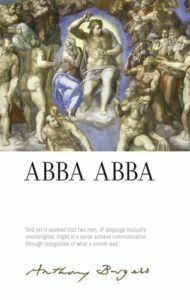 The new Irwell edition of ABBA ABBA restores and annotates the original 1977 text. A new introduction by Dr Paul Howard, Senior Teaching Fellow in Italian at Bristol University, gives a wide-ranging account of the novel’s contexts. The appendices include a variety of previously uncollected writings by Anthony Burgess on Rome, Belli and the art of translation. Burgess wrote ABBA ABBA during a particularly experimental period of his career, in which he wrote novels such as MF, based on the structuralist anthropology of Claude Levi-Strauss, and explored the life of Napoleon through the prism of Beethoven’s Eroica in Napoleon Symphony. ABBA ABBA is a similarly inventive response to the literature of the Romantic era, and it is influenced by Burgess’s own experience of living in Rome. The novel can be seen as a companion piece to Beard’s Roman Women, which was written immediately before ABBA ABBA and published to great acclaim in 1976. The Irwell Edition of the Works of Anthony Burgess, published by Manchester University Press, aims to produce critical editions of all Burgess’s novels and non-fiction books. Each volume includes an editor’s introduction, a newly edited text, comprehensive notes and annotations, plus previously unpublished materials from the Burgess archives in Europe and North America. Previous volumes in the Irwell Edition include A Vision of Battlements (edited by Andrew Biswell), The Pianoplayers (edited by Will Carr), Puma (edited by Paul Wake), and Beard’s Roman Women (edited by Graham Foster). Future volumes will include This Man and Music, edited by Christine Gengaro; Mozart and the Wolf Gang, edited by Alan Shockley; and They Wrote in English, edited by Adam Rounce. Click here to visit the Manchester University Press website for more details and to order copies.